Printer Christopher Brady was called to Liberty Hall on Easter Sunday 1916 for a special job – he was stunned to read the text of the Proclamation calling for a Republic. Reading a first edition print of the Proclamation in the immediate aftermath of the Rising. THIS WEEK, Voices is dedicated to the men, women and children whose first-hand experiences contributed to the rich patchwork of testimony that chronicles the events of 1916. Christopher Joseph Brady, from Cabra in Dublin, was a printer of The Workers’ Republic, a weekly paper connected to the Irish Transport and General Workers’ Union. In 1916, he became involved in helping print what British authorities had deemed ‘Rebel Papers’, works with titles such as Spark, Honesty and The Gael. The Workers’ Republic soon fell under that category too. 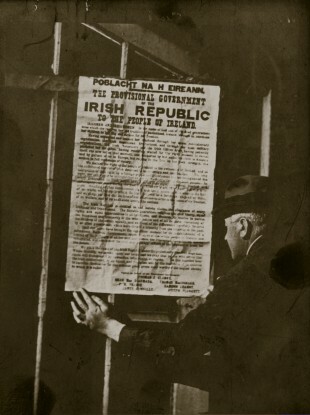 In the run-up to Easter Week, Brady was co-opted onto a small team responsible for publishing what would become one of the totemic documents of Irish history, the Proclamation of an Irish Republic. They rushed into the shop and proceeded to seize copies of The Gael which was usually printed at Stanley’s Works. This was regarded by those in the hall as merely an excuse for a general survey for the feeling of an approaching crisis was then in the air. The three women [manageress Jane Shanahan, secretary Helena Molony, and Rosie Hackett, after whom the new Luas bridge across the Liffey has been named] were behind the counter and I was looking through a little door with two spy holes in it in the machine room. I saw the raid and hastily went for James Connolly who was upstairs with Madame Markievicz and others. Connolly came down quickly, walked, quietly to the counter with drawn gun in his hand. A few feet away Miss Molony was already covering the police with her automatic. Connolly looked sternly at the police and gave his command to them: “Drop these papers or I will drop you”. At this moment Madame Markievicz who had gone out through the front door of Liberty Hall had come round the street corner and appeared at the entrance to the Co-op behind the raiding police. As she entered, a hot-headed young policeman was urging his comrades to rush Connolly, but as he spoke Madame came forward. She too had them covered and they realised they were surrounded. At once they changed their tune and said, “Of course we are only doing our duty and we have no warrant for this raid.” With this they beat a quick retreat. The raid, while unsuccessful, must have been enough to unnerve Brady and his colleagues but the printer showed no hesitation when James Connolly asked that he and his compositors William O’Brien and Michael Molloy arrive in Liberty Hall on Easter Sunday morning for an unspecified but confidential job. He met us on the steps of Liberty Hall on Easter Sunday morning, brought us upstairs to one of the rooms and introduced us to Tomás MacDonagh. James Connolly said, “These are my three workmen here”. When he had read it over to us he handed me the manuscript first to read and when I had read it he asked me to pass it on to my two colleagues. When he had finished reading he asked for a decision. I said, “As a humble workman I consider it a great honour to be entrusted to do such a heroic job.” The others answered in a similar manner. When I read the document I fully understood that it was a document proclaiming an Irish Republic and that it meant war, but my colleagues and myself were unanimous in our decision. Brady and his two workmates set to their task, on an old printing machine and with a shortage of type “so great that wrong fonts had to be used and I had to make a new letter by converting an ‘F’ into an ‘E’ from sealing wax to make up the supply”. Despite these technical challenges, the men managed to run off 2,500 copies and the first proof was given to James Connolly to check at 9pm on Easter Sunday. He had one change to make – the name “Eamon” was spelled incorrectly. When we had finished the printing of the Proclamation and everything was cleared the Proclamation was parcelled up and delivered to Miss Helena Molony. In the early hours of the morning large bodies of Volunteer and Citizen Army men were arriving at Liberty Hall. They were fully armed. They were accommodated there. At this stage my comrades and myself left the premises and returned home. The full testimony of Christopher Brady can be read at the Bureau of Military History here. Email “Voices of 1916: 'I knew it meant war - but I was honoured to print the Proclamation'”. Feedback on “Voices of 1916: 'I knew it meant war - but I was honoured to print the Proclamation'”.